Public services in Devon face "devastating" cuts, the leader of the county council has said in a letter to Communities Secretary Eric Pickles which has been obtained by the BBC. Economic development projects, youth services and libraries are vulnerable, writes John Hart, leader of the Conservative-controlled council. The prospect of council tax hikes after three years of freezes is also raised. The government said the public sector needed to "do its bit" to cut deficits. The council has slashed £100m from its budget since 2009, when spending was about £600m a year, and it is attempting to cut another £100m by 2017. It has also shed about 3,000 jobs through a recruitment freeze, bringing the total to about 5,000. But in the latest in a series of warnings on cuts, Mr Hart expresses "deep frustration" with the way councils are being treated. John Hart is a lifelong and loyal Tory with a family history of Conservatism, so such a strongly-worded letter as this demonstrates grave concerns at the cuts being imposed under the government's austerity agenda. On a wider political level, it also exposes a frustration among grass roots Tories that ministers in London do not understand them and have not been acting in their interests. That sense of disenchantment among those who the party relies heavily upon when campaigning will be a worry for the Conservative Party with a general election less than two years away. "The impact of your spending review has not been accurately portrayed," his letter to Mr Pickles says. Mr Hart said Chancellor George Osborne had predicted in his latest spending review that local authorities would face cuts of 2.3% in 2015-16. But Mr Hart claimed the the average cut would be 15%. 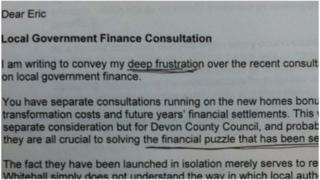 He ended the letter warning: "We cannot make these extra savings without reducing substantially the services we offer to the people of Devon." Council leaders will hold a series of meetings over the coming weeks with district, town and parish councils, and the public, to discuss the cuts. A spokesman for the Department for Communities and Local Government said: "Councils account for a quarter of all public spending and councils are forecast to spend £102bn this year, up on the year before. "Every bit of the public sector needs to keep doing its bit to pay off the inherited deficit, and the government has secured a good deal for local government, including freezing council tax for a further two years. "Councils can do more to recover the £2bn a year of uncollected council tax, reduce the £2bn lost to fraud and error and use £19bn of reserves."